On Friday the Province and City of Vancouver will announce their plans for a one-year 'post-Olympic' party on February 12th in Downtown Vancouver. However, there will be a whole weekend of activity at the Richmond Oval. The folks at the City of Richmond gave us a heads up, so we pass along the info for "Winterfest Weekend" taking place Feb. 12-13. A showcase of sport and culture will celebrate the winter season, when the popular annual Winterfest Weekend returns to the Richmond Olympic Oval on February 12 and 13, 2011. 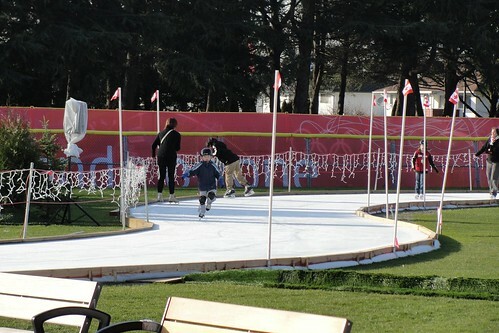 This year’s festival will also mark the first anniversary of the 2010 Olympic Winter Games, including the chance to skate with some Olympic champions and other activities that will help relive memories of the Games in Richmond. This year’s festival will feature main stage entertainment throughout the day, free public skating and ice sport demonstrations, interactive sport activities, special cultural presentations, art displays and sales, children’s activities and more. It will also give the community a chance to check out the new post-Games Richmond Olympic Oval. Winterfest Weekend runs from 11 a.m. to 7 p.m. on Saturday, February 12 and 11 a.m. to 6 p.m. on Sunday, February 13. Winterfest Weekend will include a tribute to the first anniversary of the opening of the 2010 Olympic Winter Games. On February 12, Olympic speed skating medallists Kristina Groves and Denny Morrison will be on hand for special Skate With A Champion free public skating sessions on the Oval’s two Olympic-sized ice sheets. A special appearance by snowboarder Alexa Loo’s, Richmond’s own 2010 Olympian, is also scheduled. The Oval’s incredible versatility will be put to the test as dozens of local sports groups present displays and interactive demonstrations. The popular band Five Alarm Funk, Glee-style entertainment from the Showstoppers and performances by Richmond O Zone favourites like The Jardines and Abandon Paris will highlight a diverse array of music, dance and other performances on the Winterfest mainstage. A selection of Richmond’s visual artists will also be on hand to showcase their talents in a wide variety of disciplines from carving to pottery to photography. Roving performers will wander the site and there will be a children’s activities area and food booths on the Oval plaza. Festival goers can also meet John Furlong, the man most responsible for the success of the 2010 Games, as he launches his new book about his Olympic experience. Winterfest’s special 2010 Games Zone will feature a variety of interactive displays and activities, including displays of Olympic memorabilia from the BC Sports Hall of Fame and the popular Immersadome bobsleigh virtual simulation from the BC Lotteries Games Dome at the Richmond O Zone. Coca-Cola will also present a display of Olympic memorabilia, along with a visit by the popular Coke polar bear mascot, product sampling and an Olympic pin giveaway. A special Richmond’s Torchbearer procession and salute will also take place on February 12 and visitors will have a chance to get their picture taking carrying one of several Olympic torches. Festival goers can also relive the history of the Games through a special display of Vancouver Sun front pages and the City of Richmond Archives’ special photographic exhibition from the Richmond O Zone. Admission to Winterfest Weekend is free. More details will be announced soon. Visit our website at www.richmondwinterfestival.ca for full programming announcements.